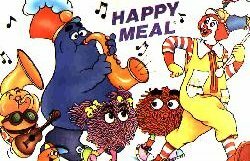 In the US, Happy Meals have been available since 1977. Hundreds of millions of Happy Meal items have been produced. These items are given away free to customers purchasing the children’s Happy Meal, and are often called premiums. Some items are also available to buy, and some are available free such as flags and place mats. As McDonald’s expanded outside the US, Happy Meals and other memorabilia began to be available elsewhere such as in the UK, Australia, Japan and Hong Kong. There is now an enormous amount of material for the avid collector to acquire, with variations and country specific items adding to this variety. The quality of the Happy Meal toys and packaging has always been recognised, and in recent years a growing number of licenses have been granted giving the McDonald’s collector more variety than ever. It has been noted that a good promotion will attract a lot more parents through the door with children. Popular names such as Disney, Barbie, NASCAR and Star Wars help increase awareness and the collectability of the toys. Two well-publicised ‘Teenie Beanie Baby’ promotions in the US created a huge amount of interest. In the first wave, 100 million toys sold out in two weeks; the second was even more popular. Another Winnie the Pooh promotion in Hong Kong also caused a great deal of worldwide interest, and the 101 Dalmatians promotion where 101 different toys were available still has collectors hunting. These free toys are increasing in value and in the short term, it looks like that trend will continue. value. It is often the case that the Happy Meal box can be of more value than the toy. Different promotions around the world with different toys and merchandise mean that collectors have a hard time (impossible) collecting everything. Country specific toys are of greater value to collectors in other countries. A Smurf promotion in the US was repeated in the UK, but one the of Sm urfs available (holding a Happy Meal box) was not available in the US. This has meant that this Smurf is quite sought after. McDonald’s memorabilia and collectibles do pre-date the Happy Meal. Marketing promotions for McDonald’s restaurants have featured their mascot Ronald McDonald and other characters for well over twenty years, and early toys and material are very popular. Collectors might specialise in a certain type of toy such as Disney related or wind-up. As technology and production costs increase, some toys are becoming more elaborate with mechanical and lighted parts. As with most toy collecting, things that move, light up or play a tune are more sought after and potentially of more value.